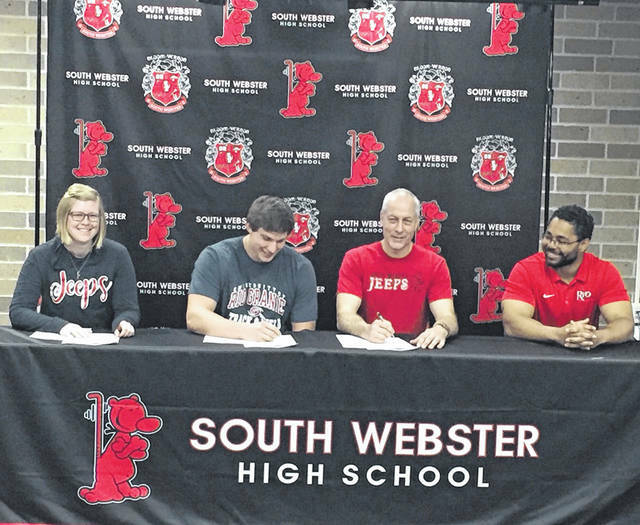 South Webster senior Josiah Edwards signed his letter of intent to join the University of Rio Grande’s track team next spring at his signing ceremony Tuesday morning. SOUTH WEBSTER – At his signing ceremony Tuesday morning, South Webster senior Josiah Edwards put pen to paper and signed his letter of intent to enroll at the University of Rio Grande this fall with plans to join Red Storm’s track team next spring. When asked what stood out about Rio Grande that made it his choice, Edwards went on to say it how similar the atmosphere there was to that at South Webster. Upon graduation from South Webster this spring, Edwards says he plans on studying Elementary Education as his major. As a member of various sports during his high school years, Edwards says the memories he’s made being a Jeep are those that will last a lifetime. But, before graduation this May, Edwards has some unfinished business to take care of as a part of his Jeeps track team this Spring.